DogLoverStore is happy to introduce to you, our new solid wood pet memory dog breed memorial keepsake boxes! What makes this gift great is that it can be used for many different purposes, they have a multitude of uses. They can be used as a resting place for your passed dog. A memorial box to store keepsake items of your dog. An accessories box to store anything like your keys, personal property, even collectible items. Not only are they great for you, but they are also great to gift to other dog lovers like yourself. Each box is 6.75 x 8.75 inches and is made to order. Because of this, each box takes approximately 7 business days to produce and ship. You can also customize each memorial box to personalize it to your dog or another dog lover’s dog. 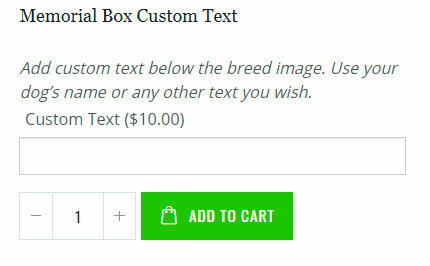 When viewing one of our memorial boxes on our website, you will see a section titled “Memorial Box Custom Text” where you can enter custom text into the “Custom Text” box. Enter up to 25 characters that will be included below the breed of the memorial box. The same font will be used as the “No longer by my side but forever in my heart” text but size may vary due to fitment. Customization costs an additional $10.00. This customization can be utilized for the dog’s name, the date they passed, the date they were born, or even another date signifying a special time you shared with your dog. View all breeds available here: Dog Cremation Memorial Keepsake Boxes. If you have any suggestions for other breeds you would like us to add, send us an email.